In my long life I have known some great economists but I have never counted myself among their number nor walked in their company. I have made no innovations in high theory. My contribution to economics has been to urge the inclusion in our analysis of features of the economic system so obvious that, like the postman in G.K. Chesterton’s Father Brown tale, The Invisible Man, they have tended to be overlooked. This neglect of other aspects of the system has been made easier by another feature of modern economic theory – the growing abstraction of the analysis, which does not seem to call for a detailed knowledge of the actual economic system or, at any rate, has managed to proceed without it. At its conclusion, Coase’s speech acknowledged that it would not be well received by those within his own profession, predicting that “some may even be offended” by his words. That was no real downside to a man of his conviction, of course, as he said finally “a scholar must be content with the knowledge that what is false in what he says will soon be exposed.” Ronald Coase was a true scientist and an economist to admire in an age where statisticians pass for them. He took the time to understand what was truly meaningful beyond just correlations, and was thus noteworthy for how such basic inquiry actually stands out. Though he wasn’t speaking directly to central bankers, his admonishment has been proven time and again by them. Economists, those as statisticians, remain totally devoted to their math no matter whatever else in actual observation – to our great cost. Just a few weeks ago on occasion of the ninth anniversary of August 9, I recounted one such disparity in the weeks and months leading up to the eurodollar’s fatal break in the summer of 2007. The FOMC had warning of what was about to occur in several market prices, especially eurodollar futures. Rather than heed them, the FOMC dismissed the eurodollar market in total as if in “disequilibrium”, a word that Bill Dudley, then head of the Open Market Desk for FRBNY, spoke repeatedly as the leader of the anti-market faction. What specifically elicited Lacker’s question was Dudley’s prior attempt at an answer, “Well, another explanation is that the economists who make the dealer forecasts are not the traders who execute the Eurodollar futures positions.” In other words, the FOMC was taking the side of the economists. This is disturbing on so many levels, to discount very good market information in favor of econometrics, and to so in blanket fashion. As Poole in August, Lacker in March even pinpointed the key inequality; “there’s something limiting the capital of people who could take the offsetting position.” If economists were so convincing, where were those “other siders” who should have been falling all over themselves to take the arbitrage opportunity? Lacker, as it turned out, was absolutely right. 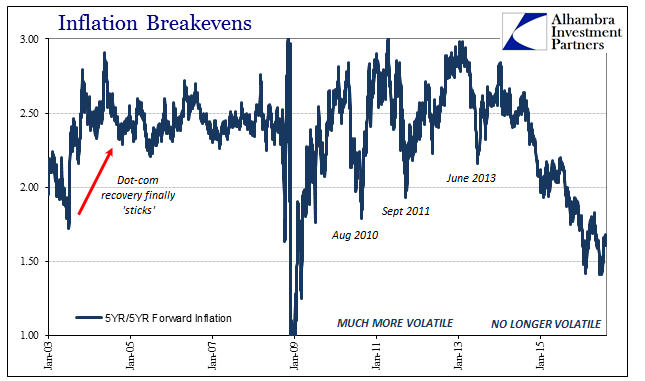 Capital constraint was the primary symptom of the looming eurodollar disaster. Eurodollar futures were pointing in that direction very early on in the crisis, yet because economists weren’t seeing it that way the problem wasn’t taken seriously enough. 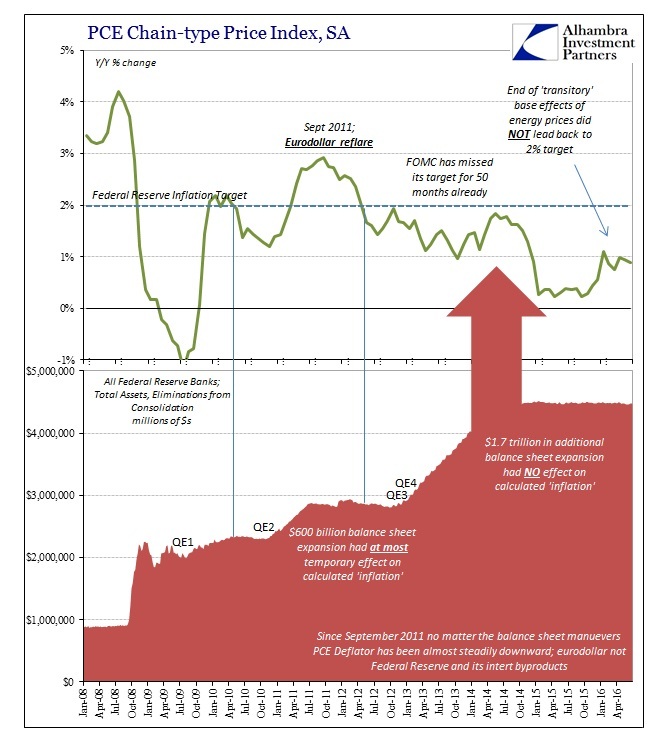 The eurodollar futures market was essentially issuing a challenge to the FOMC about monetary policy, stating that the money market view of the world was shifting to a dramatically different prediction of the global economic trajectory for the near future such that the Fed would have to react and react sharply. 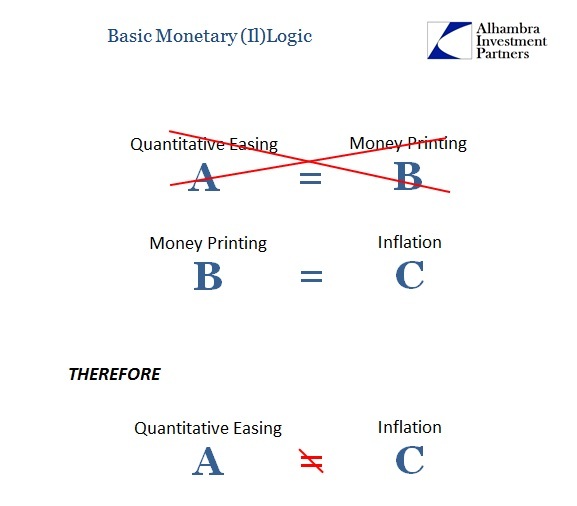 The Fed’s models, of course, showed no such problems and therefore the economist policymakers at the FOMC paid no mind to markets, leaving them wholly susceptible to Ronald Coase’s warning about actually understanding the processes policymakers are supposed to control and command. They instead stuck to their math, often vehemently opposed to even considering the market’s warning; and not long after found out the market was right after all. It is amazing that even after all that, economists today are proving that they still will only listen to other economists. The FOMC has yet another eurodollar futures problem, as noted a few days ago. Beyond that in more basic policy formulations, the FOMC has an inflation problem and one that has so far proven quite intractable (50 months below the inflation target qualifies as the “long run”). Without inflation, monetary policy is in increasing danger of de-anchoring long-term expectations, which in plain terms means the end of central bank credibility. As in the summer of 2007, monetary policy is in danger of de-anchoring even more from reality. Markets (not stocks, it should be noted) aren’t to be trusted even though they prove time and again to be right; consumers are too stupid even though after enough time they truly consider the information within markets; leaving only economists to talk to themselves about themselves in a mathematical language made only for themselves. This is “data dependent.” If it weren’t for the gravity of the positions in which these economists command exclusively it would all be a very entertaining Monty Python skit. They really don’t know what they are doing, but they can calculate very accurately what “should” happen.